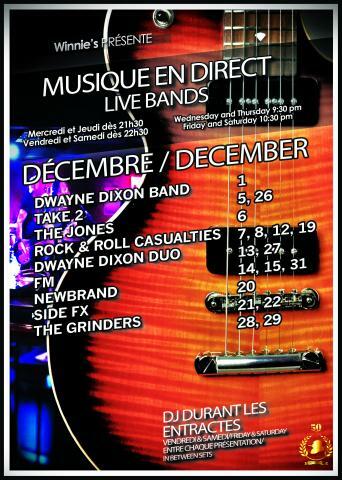 Sir Winston Churchill Pub Complexe announces it's live entertainment line-up for the month of December. Check out the great slate of bands performing at Winnie's from Wednesday through to Saturday nights. Wednesday December 12th, ‘Rock and Roll Casualties’ will be rocking Winnie’s Bar Restaurant starting at 9:30 PM. They return on Wednesday December 19th as well. On Thursday December 13th, The Dwayne Dixon Duo will be on deck. Start time is 9:30 as well. The Dwayne Dixon Duo will also play Thursday December 27th. Come over and dance off the Christmas dinner. On Friday December 14th and Saturday December 15th, ‘FM’ will be entertaining the crowd at Winnie’s. ‘FM’ have been a staple for live music at Sir Winston Churchill for some time now. As an added feature, ‘FM’ will be our live band featured at our New Year’s Eve party on Monday December 31st. If you have yet to buy your NYE 2019 tickets, Click Here. We still have good packages available however they are limited and are going fast. Don’t be disappointed and order your tickets today. ‘Newbrand’ will be playing and entertaining the crowd on Thursday December 20th. They will start at 9:30 PM. The Complexe will be hosting the ‘Ugly Christmas Sweater Party’. There will be special prices on festive drinks and shooters starting at 9:00 PM. Be sure to wear your ugly Christmas sweater and get a free drink in return. There will also be a special guest appearance from ‘The Grinch’. ‘Side FX’ are on deck for Friday December 21st and Saturday December 22nd. Start time is at 10:00 PM. The last Friday and Saturday of December, ‘The Grinders’ will bring their special brand of music to Winnie’s.